In terms of energy efficiency, windows and doors are a home's biggest weak spots. Historically, poorly sealed doors and single-pane windows have served as freeways for incoming air. Most homeowners are well aware of this, having walked by an old window and felt the unsettling chill of an icy winter breeze. Fortunately, window and door manufacturers are human too, and they've felt the same chilly drafts. In response, there have been monumental improvements in the energy efficiency of windows and doors. Even still, new windows and doors are manufactured with improved efficiency in mind. The biggest leaps toward window efficiency have come through new glazing techniques. Glazing occurs when the manufacturer hermetically seals two panes of glass together, leaving a small air space between the two. The added glass, combined with that important air space, helps prevent heat flow, in or out. In many cases, the air space is filled with gasses, such as Argon, to further reduce radiation. Low-e, or low emissivity, coatings can also be added to one of the panes of glass. These thin, nearly invisible coatings deflect light waves that transmit heat. They will increase the cost of the window by 10-15% but can increase efficiency by up to 50%. When purchasing new windows or doors, there are two key measure of efficiency that should be considered. The R-value of a window or door is a measure of heat loss, typically through the glass. The higher the R-value, the higher the efficiency. For example, a single-paned window will have an R-value of R-1, while a double-paned window's value is R-2. U-value takes that simple equation and adds time into the mix. U-value measures the heat that escapes per hour. In this case, the lower the U-value, the higher the efficiency. 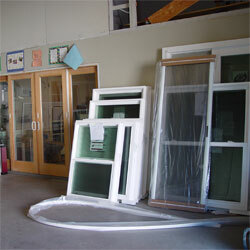 Doors, while they usually do not have as much glass as windows, are still very susceptible to heat loss. Air leakage is the biggest problem for doors. Nonetheless, hollow versus solid-core doors expose a big difference. Doors, too, have U- and R-values that need to be considered. It is not only glass that conducts heat back and forth. Metal and wood also do it to different extents. Fortunately, you do not have only the manufacturers to trust regarding energy efficiency. With the push toward energy efficient doors and windows, tests have been developed to set truly efficient products apart from the competition. It also makes shopping for windows and doors much easier. The two labels to look for on new products are from Energy Star and the National Fenestration Rating Council. They use slightly different criteria for awarding their label, but you will likely see them side-by-side on a good door or window, along with low U-values, high R-values, and certainly some quality glazing. Dan Harding loves energy efficiency and writes about residential solar power and efficient replacement window installation for CalFinder. Simply click here to return to Energy efficient homes.